Late to the Garden Party: New Plants! 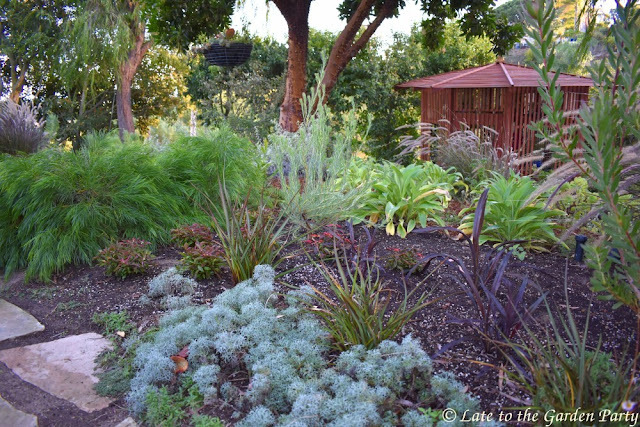 Fall is the best time to plant in our climate and, although the thermostat turned up again this week with the arrival of our moisture-sucking Santa Ana winds, I've been moving ahead with my own planting plans, aided in part by friends in the social media sphere. About 2 months ago I left a comment for Tamara of Chickadee Gardens expressing admiration of her Callistemon viridiflorus, a plant I've been searching for, quite literally, for years. 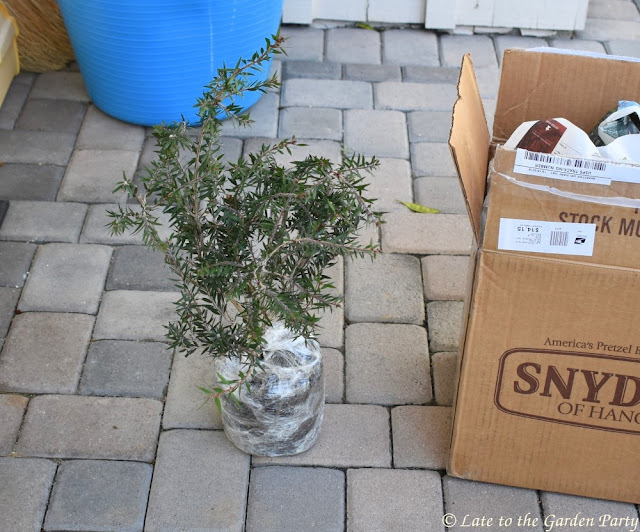 At one point, I made contact with a mail order nursery about purchasing the plant but, after exchanging a couple of messages, I got no further response. I consulted a Southern California nursery specializing in Australian natives but they weren't carrying the plant so I bought another species that reportedly produces green flowers 50% of the time and red flowers 50% of the time. After more than 2 years, it still hadn't produced a single flower, green or red, and I gave up on it. To my surprise, in response to my comments on her blog, Tamara offered to find the plant for me and she did! It arrived earlier this week. I planted it the very same day (with a little help from my husband in digging a good hole to give it the best possible start). Here's the Callistemon in its selected spot, formerly occupied by a Grevillea lavandulcea that went into decline last year. I'm going to add a ground cover around it while it settles in and gains size. Tamara's delivery was followed 3 days later by another box of goodies, from a party who wishes to remain unidentified. 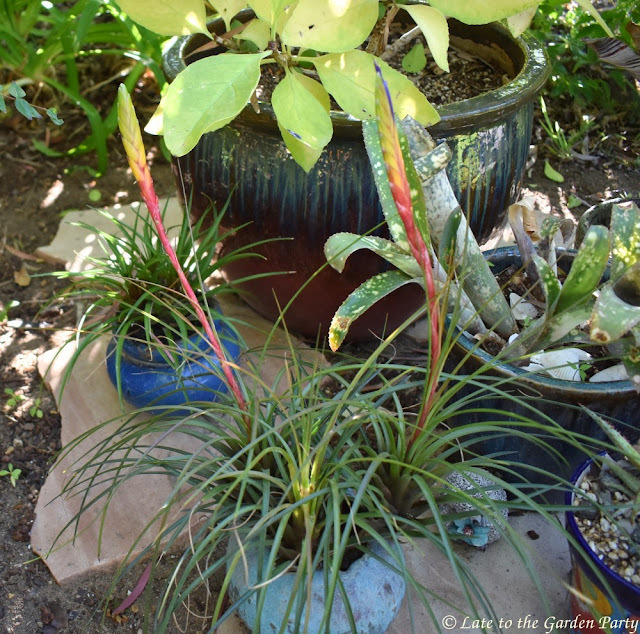 On the left is Billbergia Quesnelia marmorata 'Tim Plowman', which I've been trying to hunt down for more than a year after seeing it at Sherman Gardens. 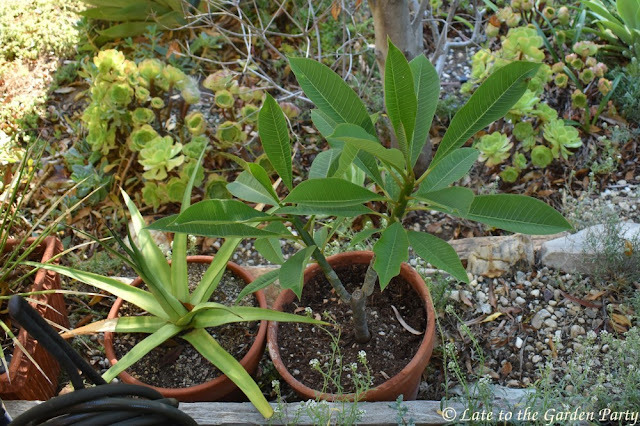 On the right are 2 pups of Mangave 'Kaleidoscope', the largest of which was as big or bigger than the plant I'd previously mail-ordered from a major nursery. 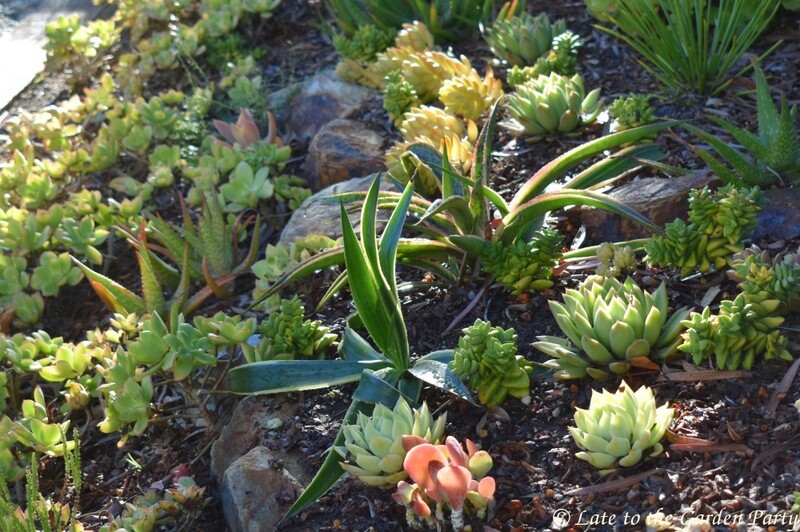 I promptly planted those as well. 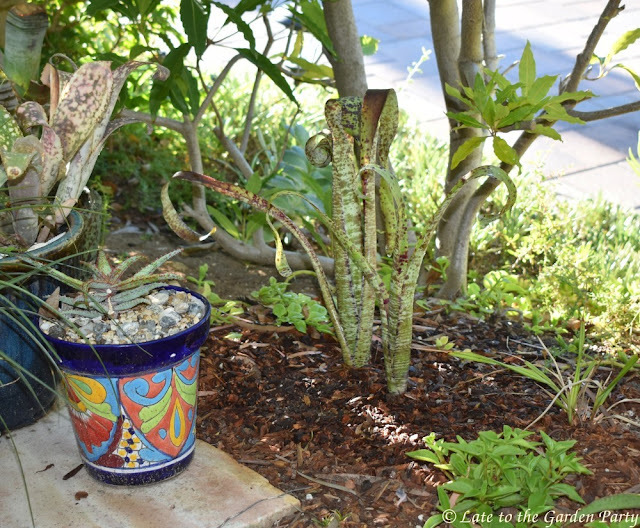 Our Santa Ana winds make me feel as though I'm being mummified alive so I can only imagine the impact on plants and I didn't want to risk their health by dawdling. 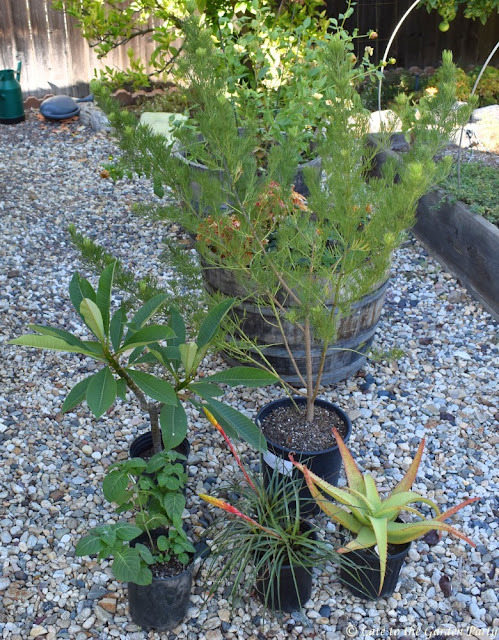 In addition to these wonderful plants, I picked up several on my own at the fall plant sale at South Coast Botanic Garden. While the fall sale has been scaled back in recent years, they still had a good selection. I picked up 3 plants when I attended the official sale last Saturday with a friend and then 2 more when I made a trip back to the garden to attend a meeting on Monday morning. I got all 5 of these plants tucked in this week too, although 2 of them went into pots. 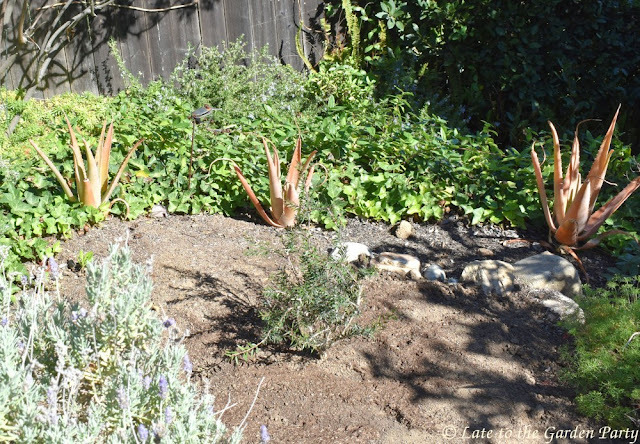 This is Aloe vanbalenii x striata, which I planted in the succulent bed on my front slope. I love the color but I've no idea of its mature size. 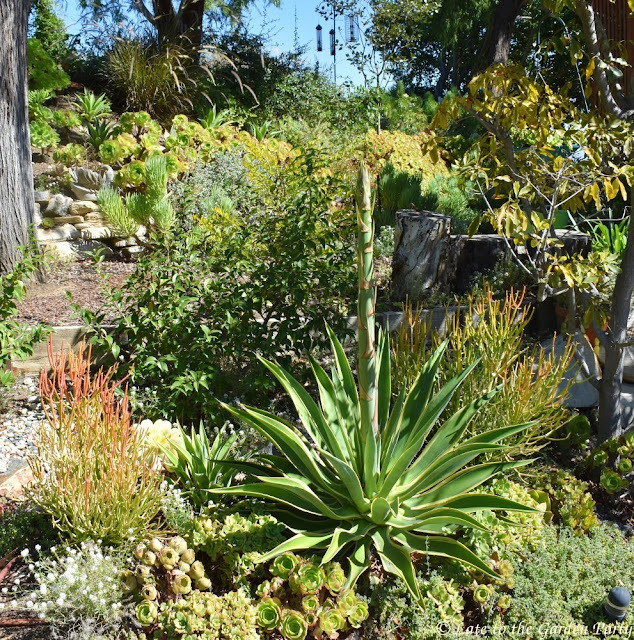 I previously picked up an Aloe vanbalenii x ferox hybrid at another SCBG sale and it's done well in my garden thus far. This is Hypoestes aristata (aka ribbon bush). I had a splendid specimen of this plant in my former garden but I've had poorer results with it in my current garden. I'm hoping this one finds this particular spot in my front garden to its liking. You can get a look at its flowers here. This is a noID Plumeria (aka frangipani). I don't even know what color flowers it'll produce. I've killed a number of these plants but I've seen them growing in gardens in the surrounding area so I remain hopeful. I think my biggest challenge will be to get the watering schedule right. This is Psoralea pinnata (aka the kool-aid bush because its flowers are supposed to smell like grape kool-aid). A neighbor I ran into at the SCBG sale told me this plant has done well in her garden. You can see it in bloom here. This Tillandsia wasn't labeled at all. My best guess is that it may be T. fasciculata, although the foliage color doesn't look quite right when compared to specimens shown on-line. I stuck the plant in a pot with some bark nuggets for now but the plant is ready to divide and I may break it apart once it's finished blooming. I've recently done a bit of work in my front garden too. I added Grevillea 'Ned Kelly' and Leucadendron 'Jubilee Crown' to this bed in the front garden a few weeks ago. Last weekend I added Alternanthera 'Joseph's Coat', Gaillardia aristata 'Amber Wheels', and 3 Cordyline 'Renegade' to fill in around those plants. The Gaillardia and Cordyline were marked down 50% when I found them so I figured I couldn't lose. 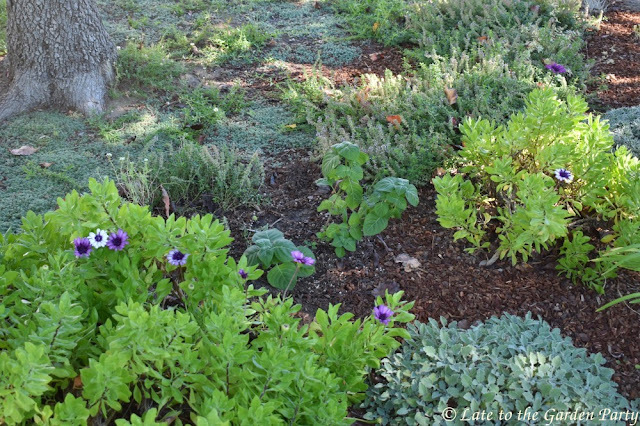 This is a closer look at the plants on the left end of the bed. I think I'm going to add more Alternanthera as ground cover and bark mulch to accent the dark Cordyline. Every once in awhile I wonder if I'm getting carried away buying new plants. But somehow it always seems there's room for something more. This week I realized that I'm going to be needing at least a couple of new plants for the succulent bed facing the street. We have one more day of very warm temperatures and dry air before our weather improves. For those of you in Central Texas, I hope the rain has abated and your area is spared any further flooding. Best wishes for the weekend. Beautiful images...the light is so pretty in the fall. It's still soggy in Driftwood, TX. Some plants are loving all the water though but I'm anxious for some sunshine. We could use rain but even I don't think I'd be anxious to get as much as Texas has received of late. I hope you're doing well despite the sogginess of the terrain. I'm living vicariously through all your planting! Can't wait to see how Amber Wheels does in your garden. Since 'Amber Wheels' was marked 50% off I'm guessing that this season's bloom period is supposed to be over. Some of my other Gaillardias bloom off and on most of the year, though, so I'm hoping that's not true. You are on a roll. How nice of the people to gift you with much wanted plants. We are having the second windy day. I know it doesn't compare to your wind events but geez, it is unsettling to me. Don't blow away. The wind is REALLY getting old, Lisa. I swear I can feel my skin stretching across the bones of my face. The temperature is supposed to drop 16 degrees tomorrow but the winds are still blowing this evening so that's hard to believe. I've never tried that, Eliza, but I understand the answer is a resounding "no." I've tried cutting the bloom stalks off some Aeoniums just for aesthetic reasons and I can tell you that didn't stock the flowering stem from dying. 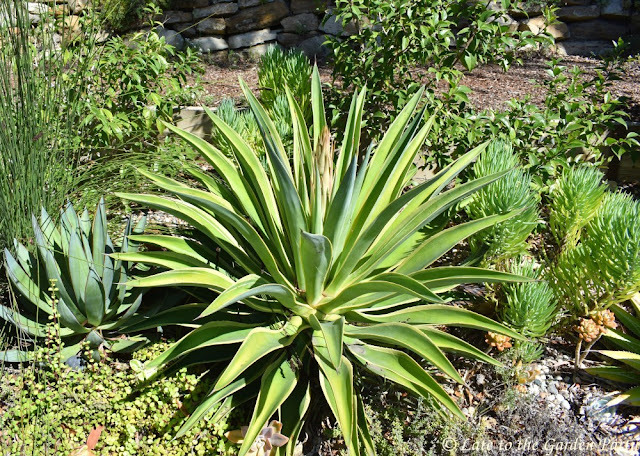 Luckily, Agave desmettiana produces both pups and bulbils, although they take their time to reach a decent size. 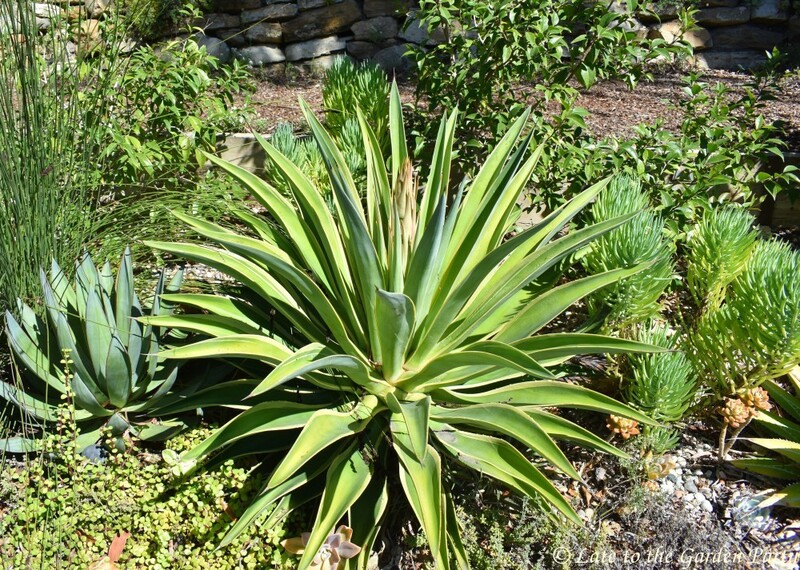 As I recall, I've already taken over 10 pups off one of the 2 Agaves in question. "Every once in awhile I wonder if I'm getting carried away buying new plants." I hear you Kris! I dropped off a plant I picked up for Gerhard last weekend and was happy to see that he had more plants in search of spots than I did. These fall sales are so compelling, and I didn't even go to half of them ! I envy all the garden sales you have up that way but I expect I'd have to find an empty lot to plant in if I had access to all the wonderful options you and Gerhard (not to speak of the folks in the PNW) have. I attended another fall sale on Friday and expected something bigger than our local sale but instead it was far more limited. The Huntington has its sale next week and, although its much larger in scale, the last 2 I attended there seemed nearly identical in terms of offerings so I may pass. Excellent additions! Your mystery gifter is very generous and has great taste. It's so wonderful to have plants I've looked for so longer in my garden at last, Loree. Both gifters were extremely generous. Just like Christmas morning! 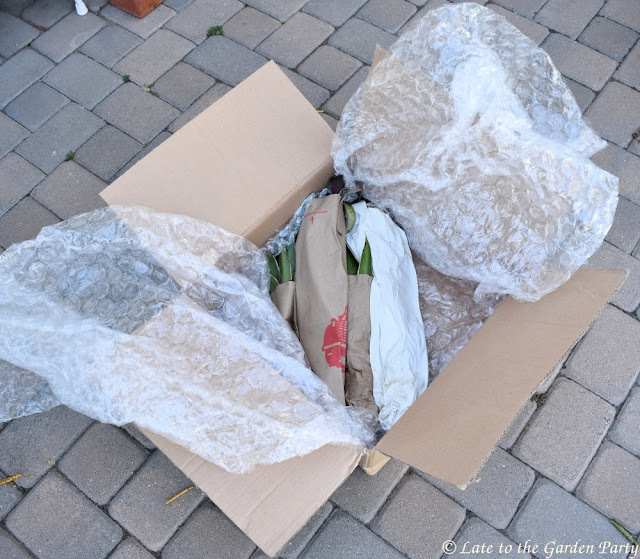 I once received a surprise box from a gardener in Germany and another from a Blogger in northern Spain. 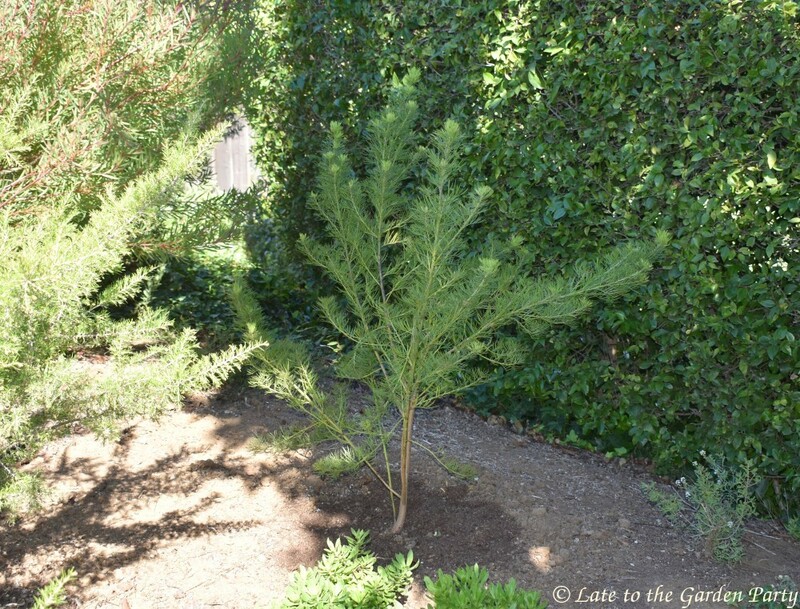 https://ladyoflamancha.blogspot.com/search/label/Santa%20Claus I'll be very interested to see how that Callistemon looks in bloom. So pretty! It was like Christmas! I find it very odd that Callistemon hasn't been available down this way, especially as everything in that genus seems to do well here. Fingers are crossed that it doesn't have some quirk that causes it to dislike Southern California. It has been hot and dry here in the SF Bay Area for the last week+ as well, although we have not had much wind. How amazing that you have plant friends that send you gifts! 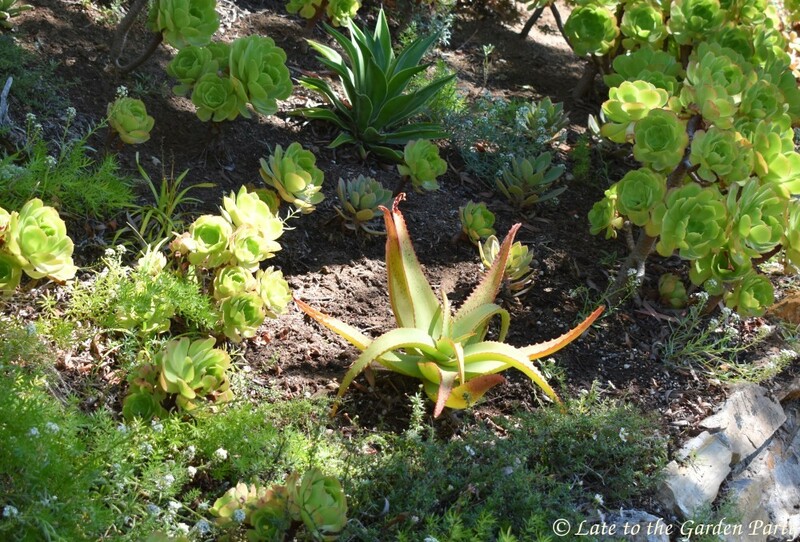 btw - I saw a mature A. vanbalenii a few weeks ago at Succulent Gardens that measured a good 3' across - beautiful plants. 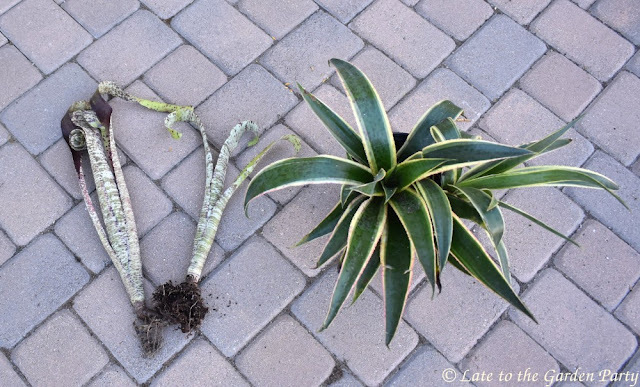 Aloe striata is smaller so the hybrid's eventual size is still up in the air I think, Hans, but, if it shows signs of getting too big for the spot I selected, hopefully I can move it without injury. I love its color and shape. Kris—This is all very exciting. Fun to be “armchair-planting” the new babies you’ve wanted for so long (I’ve got the easy seat!). That Tamara, what a gal! Tamara's intervention in my increasing frustrating plant search was a major boon, Alyse. She's wonderful! I think insufficient water has been the cause of my prior failures with this plant here, Diana. I'm trying to be more attentive to its needs, at least while it's still getting established. Your new plants are so exciting Kris, they seem so exotic as they wouldn't stand a chance here. How lovely to have friends who send you such wonderful gifts. 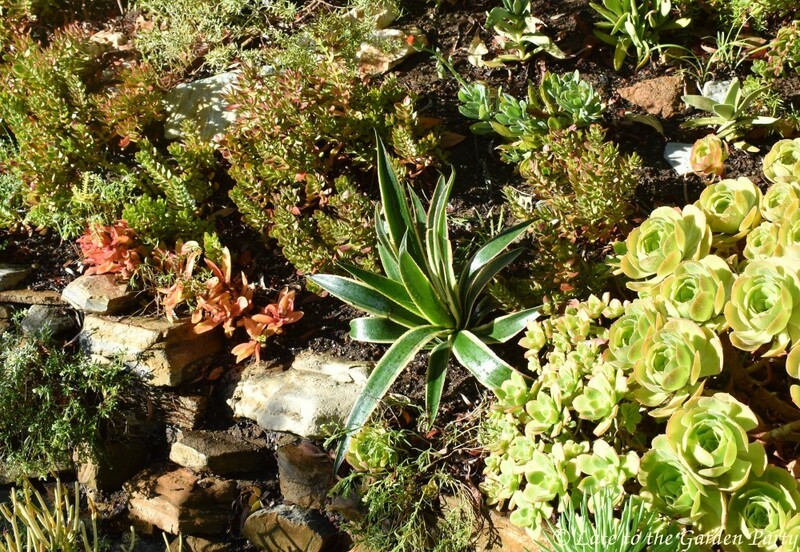 So many new and out-of-the ordinary new plants. I admired Callistemon viridiflorus on the Portland Fling, how cool Tamara sent you one. The other anonymous gifts are also choice. 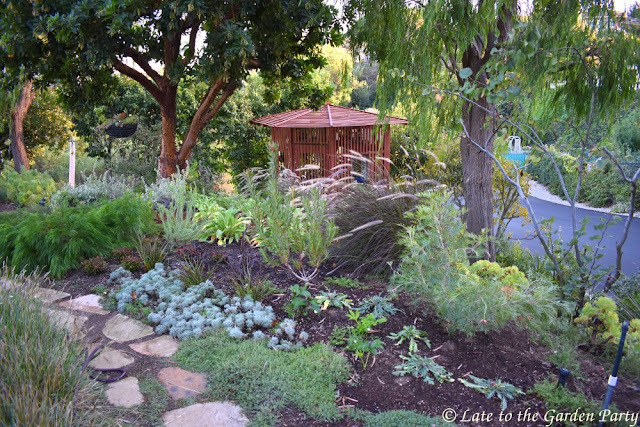 Garden bloggers are the greatest. Yes, that arid heat. My poor garden that was so happy after the rain is not so happy again. Makes for beautiful days, though. We're in Carmel for a few days and it is not hot here. I'm wearing a jacket! Forgot what long sleeves felt like. Wow, you're on a roll travel-wise. I love the Carmel area. Have a great time! A gardener can never have too many new plants! That Plumeria foliage, wow. I hope it blooms for you and does well. It looks really healthy. 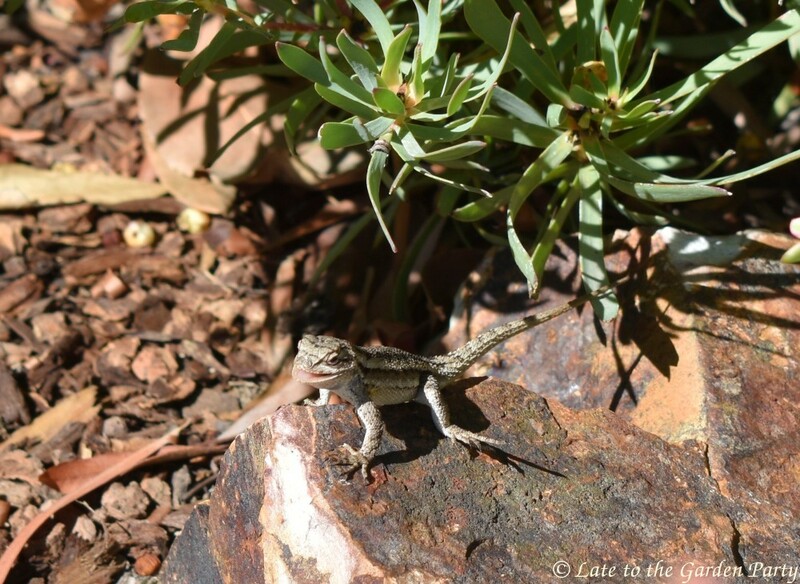 Your garden looks fantastic and I love your little critter too. Hopefully the weather will cool to a more tolerable level. October's weather is often a roller-coaster and this year is no exception, Grace. Another round of Santa Ana winds is expected today but hopefully these won't stick around long. I enjoy receiving your comments and suggestions!